This weekend weather will feel like summer and early spring. Saturday is the pick of the weekend with high temperatures in the 70s and mostly sunny skies. But ... “anyone planning outdoor activities on what should start off as a mild day should be prepared for much cooler air to arrive at some point Saturday afternoon,” the National Weather Service says. “Temperatures should drop a good 10-15 degrees in the span of an hour or two. Temperaures by sunset in the mid to upper 40s across Connecticut. Temps will drop into the upper 30s Satuurday night. On Sunday, showers are likely with a high of only 44 degrees - nearly 30 degrees cooler than Saturday’s expected high temperature. The National Weather Service says a cold front will skirt the area this morning, then lift just north of the area this afternoon into tonight. The front will then gradually drop south through the area on Saturday as strong high pressure over eastern Canada builds into New England. A strong low pressure system will impact the region from Sunday into Monday night. 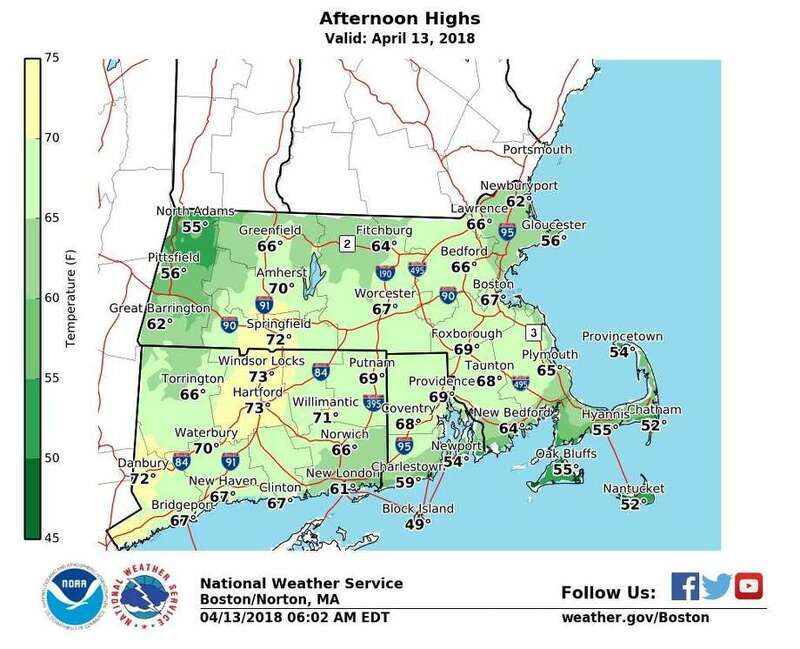 On Friday, there will be mostly cloudy skies this morning, but should give way to partial afternoon sunshine at least along the coast. Clouds may hang in longer inland if the front is slower to lift out than expected. Tonight: Patchy fog after midnight. Otherwise, partly cloudy, with a low around 52. Southeast wind 6 to 8 mph becoming southwest after midnight. Saturday: A 20 percent chance of light rain after 3pm. Patchy fog before noon. Otherwise, mostly sunny, with a high near 71. Southwest wind 7 to 9 mph becoming southeast in the afternoon. Saturday Night: A 50 percent chance of light rain, mainly after 7 p.m. Cloudy, with a low around 38. East wind around 15 mph. Sunday: Showers likely. Cloudy, with a high near 44. East wind around 17 mph, with gusts as high as 28 mph. Chance of precipitation is 70 percent. Precipitation amounts between a tenth and quarter of an inch possible. Sunday Night: Showers. Low around 39. Breezy. Chance of precipitation is 90 percent. New precipitation amounts between a quarter and half of an inch possible. Monday: Showers and possibly a thunderstorm. High near 59. Chance of precipitation is 90 percent.